These photos were taken 75 years ago tonight along Garvey Boulevard (today's I-10) on the stretch that passed through the Covina area. 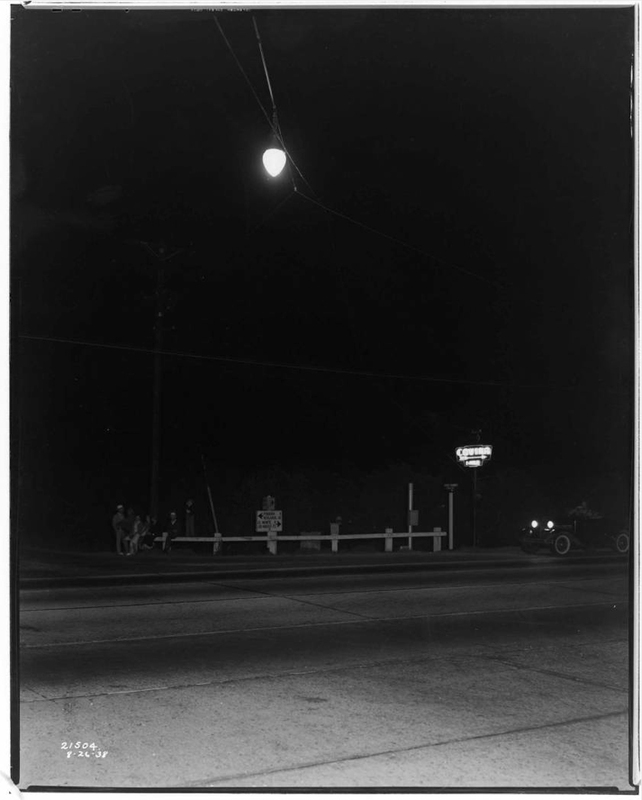 They are from the archives of the Southern California Edison Company, and were evidently taken to document street lighting along the roadway. 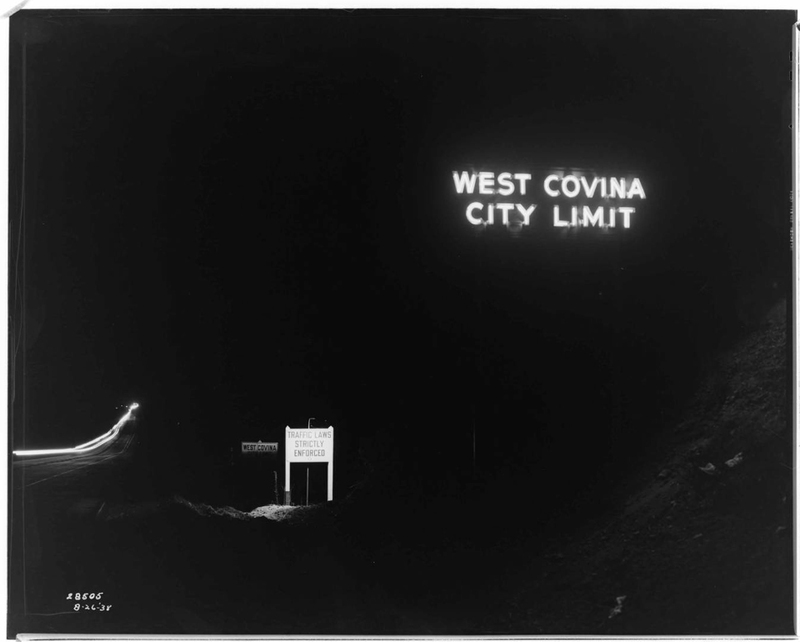 The first one shows the signage at the eastern boundary of West Covina – the city limits of which, at that time, extended all the way east to Range Avenue (today's Grand Avenue). The slope of the pavement down the grade to the Walnut Creek arroyo is recognizable even today. The neon sign fascinates me because I never knew it existed. 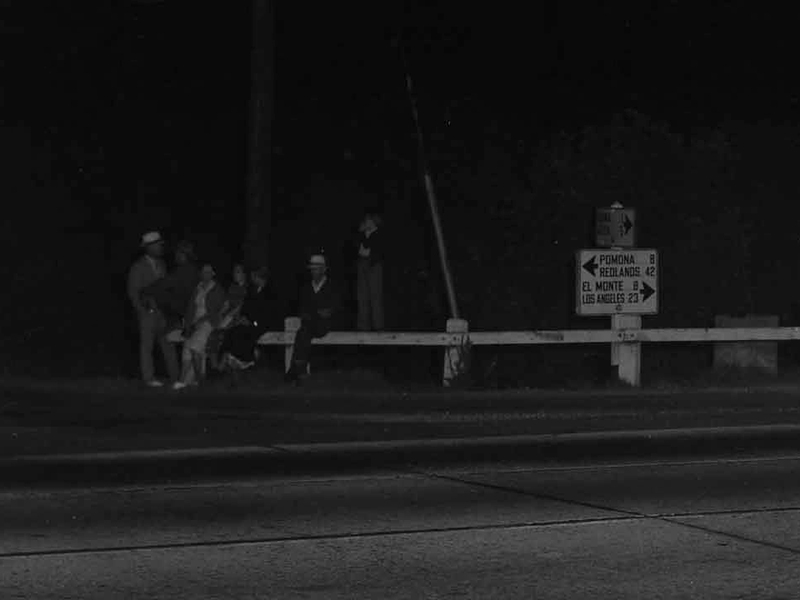 The smaller sign illuminated by incandescent light warns motorists about the speed trap that West Covina had become notorious for since the opening of Garvey Boulevard. (My father used to tell tales about the WCPD cops and their famously predatory traffic law enforcement.) It's pretty obvious from this very prominent signage that they meant business. "You have been warned!" G. Haven Bishop, photographer. From the Edison Archive. Courtesy of The Huntington Library, San Marino, CA. Link to full-size image. Here is another neon sign that I didn't know about before, either. It reads, "COVINA 1-MILE." Looking at the street signs in extreme closeup, I can see this is the intersection of "State Highway" and "Citrus Ave." The mileage sign points east to "Pomona 8" and "Redlands 42," and "El Monte 8" and "Los Angeles 23" to the west. 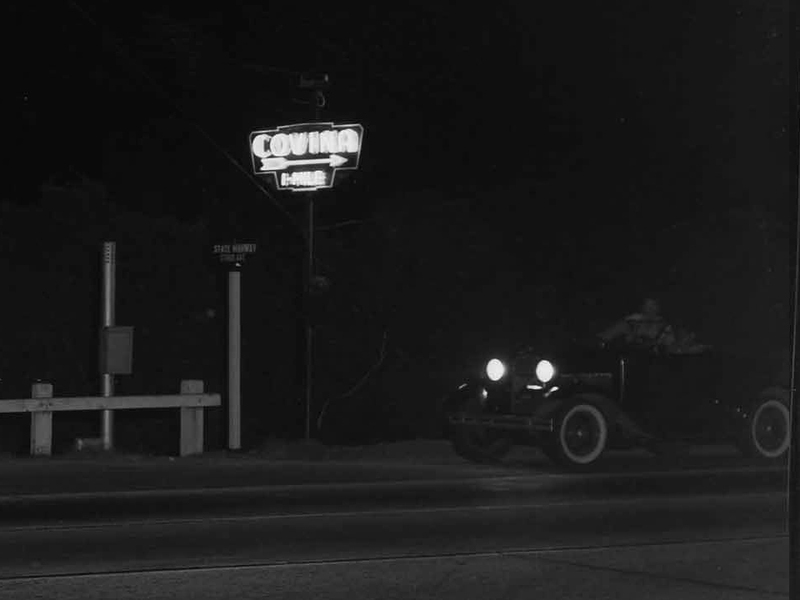 The shaded mileage sign pointing north appears to say "Covina 1" and "Glendora [illegible]." One might wonder what these people were doing hanging out down on the main drag through town at what must have been close to 10PM. Turns out they were assembling for a dedication ceremony for the new overhead street light (the neon "Covina" sign had been put in place three years previously). 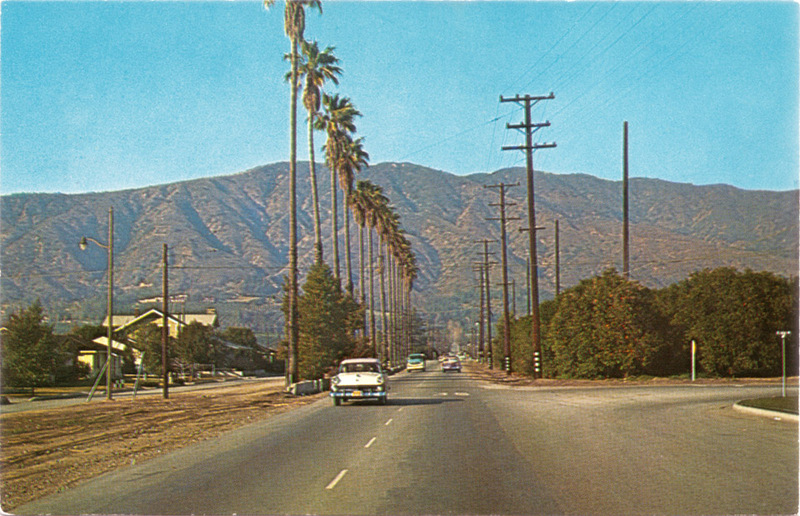 Although the postcard photo below wasn't taken in Covina (it's Grand Ave. north of Alosta in Glendora), it depicts a very typical scene in the East San Gabriel Valley in the 1950s and early 1960s: an old, narrow section road being widened in portions as the citrus groves are being developed, roadside rows of tall Washingtonia fan palms, and old grove-owner homes surrounded by new subdivision homes. Even into the 1970s, there were still several roads in and around Covina that suddenly narrowed to two lanes like this. The last one that I can remember was Vincent Ave. just south of Arrow Highway. That was finally widened to four lanes around 1980. This shows the postcard location in the present day. If you look closely, you can see that the old grove-owner house at left is still standing today.